Cardiac arrest is one of the leading causes of death in the United States with over 420,000 out-of-hospital episodes occurring annually. Survival greatly depends on getting cardiopulmonary resuscitation (CPR) immediately in order to increase blood flow through the body and deliver oxygen to the brain. Statistics show that if you are called on to give CPR in an emergency, you will most likely be trying to save the life of someone you love: a child, a spouse, a parent or a friend. Unfortunately, 70% of Americans feel helpless to act during a cardiac emergency because they don’t know how to administer CPR or they’re afraid of hurting the victim. Don’t be afraid! 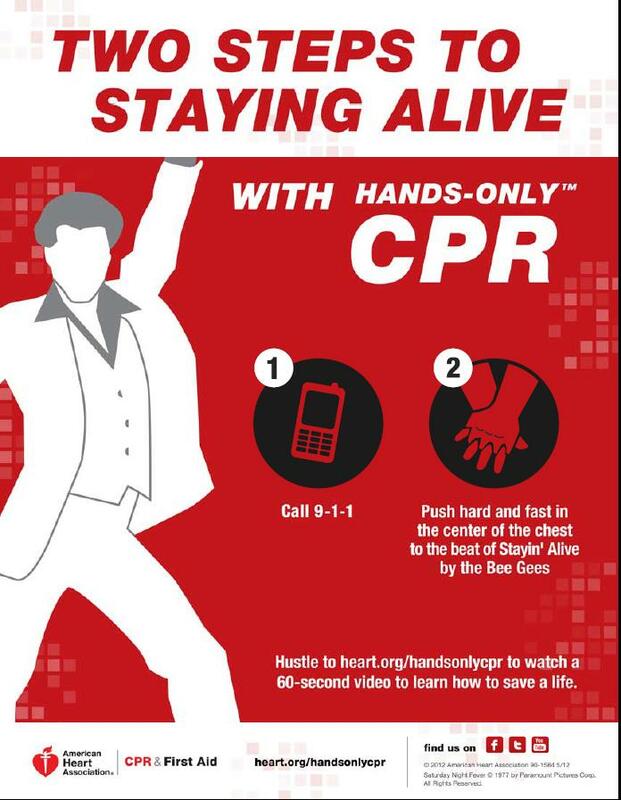 The American Heart Association and our Hands-Only CPR method are here to help! Push hard and fast in the center of the chest to the beat of the song “Stayin’ Alive” until help arrives. This hit disco song by the Bee Gees is a perfect match for the recommended rate of 100 beats per minute. People tend to feel more confident performing Hands-Only CPR and are more likely to remember the correct rhythm when trained to the beat of a familiar song. So, if you are ever put into a life-saving situation know that your actions can only help the victim. Official blog of the American Heart Association- Charlotte.